Classic Japanese Cool, Driving Spirit, Nimble, all these are terms that come mind when people talk about the AE86 Corolla. When you add a bunch of power and handling to an already fun car, you get a crazy ride. This is a lesson that Trent is not new to him. The 340hp that his Nissan S14 SR20DET engine produces to the wheels makes his Corolla fast. But fast is just the start of what makes this car cool. It is the stickers that make it... oops, not the stickers, but the whole package. With the wide Origin rear over fenders, and the 16" Work Meisters fitted under them, to the unique 2 tone paint job. This car is made with style and "becuase racecar" in mind. This car is not a show car, even though other Drift Safari team members call it that when he washes it before heading to drift events. This car is build to be drifted, and really take a bit of abuse. The stock USDM rear bumper is one of the things that was left on to do just that, take abuse. A fibreglass one would be destroyed the amount this thing has been hit. A fresh coat of paint and its like new. Inside the driver is faced with an array of guages to keep on the overall status of the engine, which is not always good in the life of a drift car. Catching that temperature spike, oil pressure drop or lean engine can make the difference in a engine that will last the rest of the day, or the rest of the season. The SR20 in this Corolla is not stock at all, a Microtech ECU controls the SARD 550cc injectors, spraying into cylinders filled with CP forged pistons, topped by the Brian Crower 264 cams, a larger S13 throttle body controls the air from the 2860RS turbo bolted to a JSP Fab manifold. All the exhaust is spent through a 3" exhaust from the turbo out the back of the car. 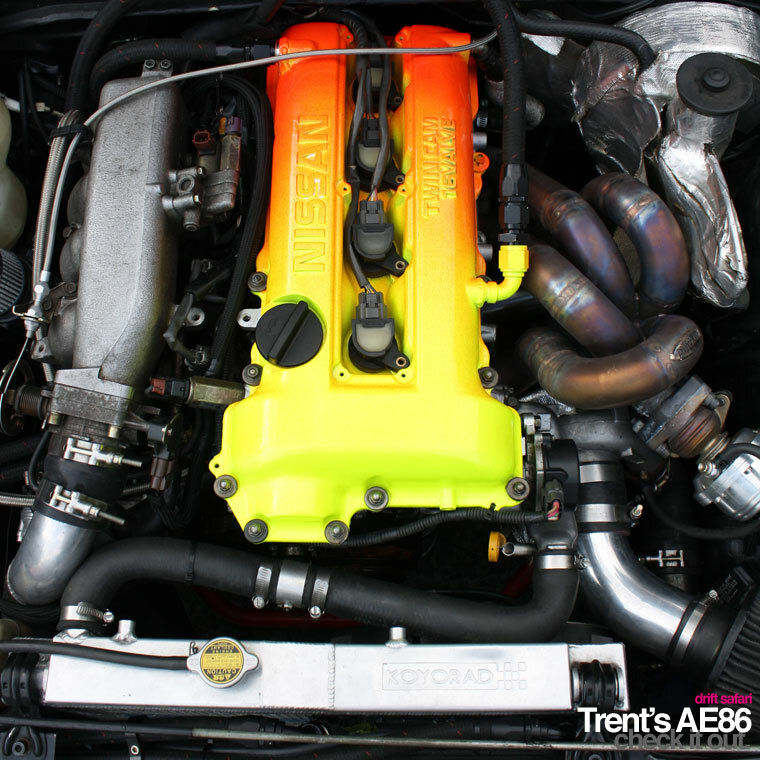 The front bumper setup for Trent's AE86 is meant to take abuse as well. 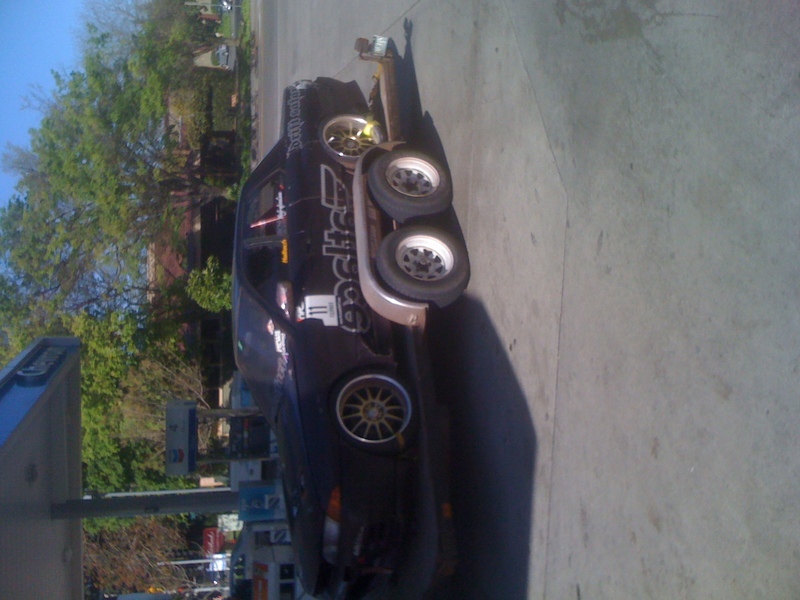 He runs a Japanese Trueno bumper, which is hard plastic, with a custom modified Volvo lip. Behind that all is a Fortress Fabrication Rondell Bar, which is build as a rebar for that accidental bump while on the track. This low stance is not the lowest the car can go on the Techno Toy Tuning coilovers, front and rear, but is a good mix of ride height and handling. Finding that good suspension setup, and not messing with it when it is dialed has been Trent's goal. Simple and agressive, this car fits that description perfectly. All photos by Zack Geng. Thanks.